Danish Army Specific: The heavy use of mines in the former Yugoslavia, gave the Danish Army a need for a mine-clearing vehicle. The choice was the SISU RA 140-DS build by the Finnish SISU Defense Company (4 implemented 1996 - 1997). 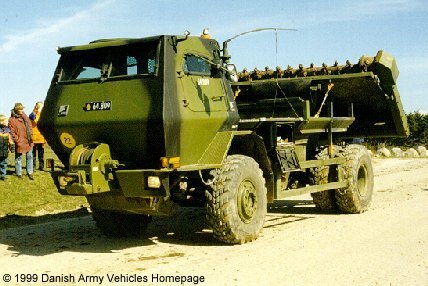 After deployment and operation in Bosnia many problems occurred, and, after evaluation of the Scottish "AARDVARK" mine clearing vehicle and a Danish project from Hydrema, the Hydrema 910 MCV, has been delivered to the Danish Army in Dec 1996. Historical: Developed by Sisu Defense (now Patria Vehicles OY) in co-operation with the Finish Defense Forces. Introduced in 1994. Length: 7.81 m (305 inches). Armour: The cab is armoured and protects the driver against 7.62 mm bullets and scrapnells. Engine: Deutz 6-cylinder, type BF 6L 913 C, turbocharged, inter cooler, air-cooled. Horsepower: 192 at 2.500 rpm. Transmission: 4-speed RENK Doromat 874 AM/PTO automatic transmission. Transfer case: Single-speed, lockable differential gear. Brakes: Dual circuit air controlled fluid disc brakes (front), drum brakes (rear). Tyres: 14.00 - R20 with Hutchinson VPPV run-flat devices. Range: 250 km (94 miles). Additional: The RA 140-DS is specifically designed to clear all kinds of on surface or conventionally buried, non-directional anti-personnel mines and occasional anti-tank mines up to 10 kg. The clearing-device is fitted with 82 chains and clears in a width of 3,4 meters. Maximum clearance speed 6 km/h for scatterable mines and 3 km/h for other types of mines. On road speed 70 km/h. Communication is maintained via a 2061 VHF-radio.